CHICAGO (jGLi) – Two surviving Filipino Americans whose members of their families were victims of murders in Illinois share opposite views on death penalty. I sought out their views following the signing Wednesday (March 9) by Illinois Gov. Pat Quinn of the ban of death penalty, making Illinois the 16th state to end capital punishment. As you know, the Philippines is one of the 95 out of the 193 members of the United Nations or members with UN observer status, which abolished death penalty. The Philippines is only one of eight out of 41 countries in Asia, which abolished capital punishment. For Reyle V. Cardino, 53, whose parents were murdered on July 8, 2009 in their home in the outlying Chicago suburb of Rockford, Illinois, said he is not thrilled by the decision of the Democratic governor. Like State Attorney Bruscato, other Illinois state prosecutors, among them, Illinois State Attorney General Lisa Madigan, had asked Quinn to veto the bill, saying videotaped interrogations and advancements in DNA technology had left no room for wrongful executions of innocent people. Taped interrogations were one of the features of a bill filed by President Barack Obama when he was an Illinois state senator. Castro, a Filipino American native of Bulacan in the Philippines, is the father of Michael Castro, one of the two Filipinos and five others, who were massacred in 1993 in suburban Palatine, Illinois. “Kung nasa kulungan sila, paglalaruan lang sila ng mga inmates. (If they in prison, they will be pestered by other inmates). Their human bodies will suffer,” Mr. Castro said. Mr. Castro said he did not get any civil damages from the owners of the fast food chain, Brown Chicken’s restaurant, because it was proven in court that the owners were not negligent – as the husband-and-wife restaurant owners Richard Ehlenfeldt and his wife, Lynn, were among those who were murdered along with his son. Don Mariano Asumpcion and Dona Maria de la Paz Molo San Agustin. Of these spouses, we were able to preserve their photo drawn only in crayon by one of their children who was a celebrated painter in the mid 1900’s. He was Don Justiniano better known as Capitan Ting. The photo measures nearly one foot high, and for the first time was reproduced and published in the No. 4 Vol. 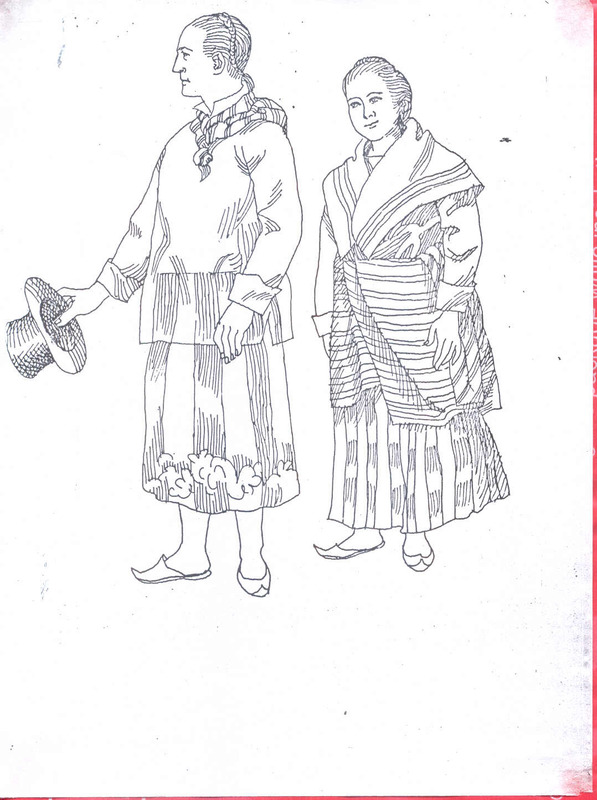 1 of the Revista Historia de Filipinas (page 60). The frontal sketch of this remembrance is a reproduction of the same by Corazon, the third grandchild of the photographed. by some members of the family that we now ignore. To him we owe the list of succession of Governors that went to the union of “meztizos” in the town of Santa Cruz, Manila. Since its foundation in the year 1741 until 1889, the list became public in the No. 4 and 5 of the Revista Historica de Filipinas. 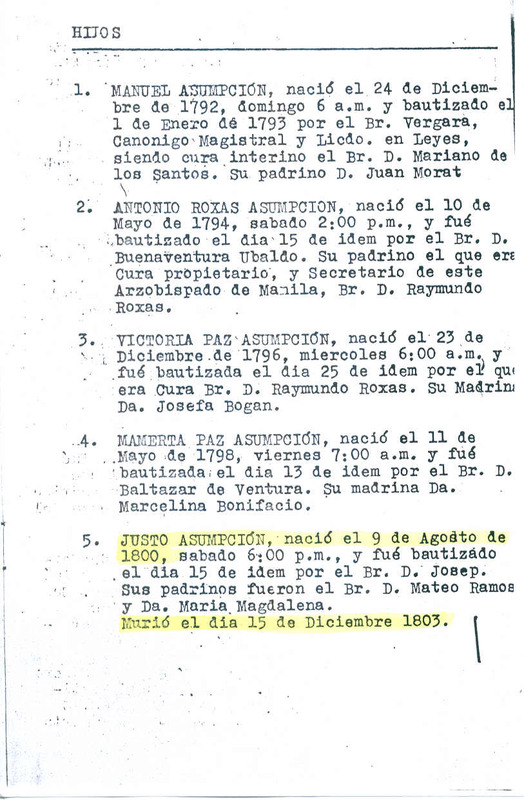 In this list ( of which the original has disappeared ) we found out that this great head of the family, Mariano Asuncion Cagalitan, was Governor in the year 1805. 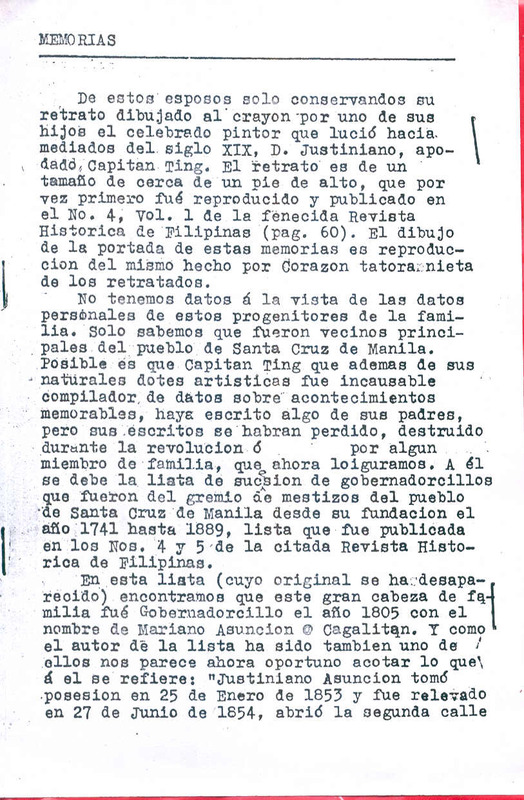 And because the author of the list was also one of them, it now appears an opportunity to enclose what he refers as follows: “Justiniano Asuncion took possession on the 25th of January, 1853 and was revealed on the 27th of June,1854, opened the second street of San Lazaro, now, Oroquieta Street, in the entrance of General Novaliches.” As it is seen in the said list, it has found more notable inserted events that took place during the term of the Governor. 1. MANUEL ASUMPCION – Born on the 24th of December, 1792, Sunday at 6:00 a.m. and baptized on the 10th of January, 1793 by Bro. Vergara, Canon Magistrate and Licensed in Law, making interim priest Br. D. Mariano de los Santos. His godfather D. Juan Morat. 2. ANTONIO ROXAS ASUMPCION – Born the 10th of May, 1794, Saturday at 2:00 p.m. and was baptized on the 15th day of May by Bro. D. Buenaventura Ubaldo. His godfather was the Head Priest and Secretary of the Archbishop of Manila, Br. 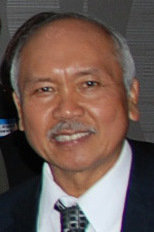 D. Raymundo Roxas. 3. VICTORIA PAZ ASUMPCION – Born the 23rd of December, 1796, Wednesday 6:00 p.m. and was baptized the 25th of December by the Priest, Br. D Ramundo Roxas. Her godmother was Dona Josefa Bogan. 4. MAMERTA PAZ ASUMPCION – Born the 11th of May, 1798, Friday 7:00 a.m. and was baptized the 13th of May by Br. D. Baltazar de Ventura. Her godmother was Dona Marcelina Bonifacio. 5. JUSTO ASUMPCION – Born the 9th of August, 1800, Saturday, 6:00 p.m. Was baptized on the 15th day of August by Br. D. Joseph. His godparents were Br. D.Mateo Ramos and Dona Maria Magdalena. Died the 15th day of December, 1803. 6. MARIANO ASUMPCION – Born the 15th of August, 1802, Sunday at 9:00 a.m. Was baptized on the same day by Br. D. Pablo de Mendoza. His godfather was D. Mariano Estanislao de Borja. 7. EPIFANIO ASUMPCION – Born the 7th day of April, 1806, Monday, at 7:00 a.m. Was baptized on the same day by Br. D. Bonifacio. His godfather was D. Juan Gualberto Antonio. Died in the year 1837. 8. 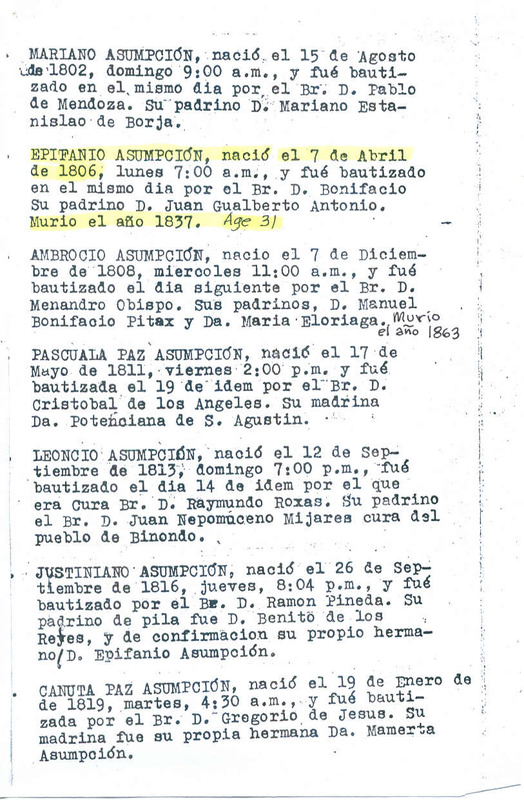 AMBROSIO ASUMPCION – Born the 7th of December, 1808, Wednesday at 11:00 a.m. and was baptized the next day by Bro. D. Menandro Obispo. His godparents were D. Manuel Bonifacio Pitex and Dona Maria Eloriaga. 9. PASCUALA PAZ ASUNCION – Born the 17th of May, 1811, Friday, at 2:00 p.m. and was baptized by Br. D. Cristobal de los Angeles. Her godmother was Dona Potenciana de San Agustin. 10. LEONCIO ASUMPCION – Born the 12th of September, 1813, Sunday, at 7:00 p.m. and baptized by Br. Raymundo Roxas. His godfather was Br. D. Juan Nepumoceno Mijares priest of the town of Binondo. 11. JUSTINIANO ASUMPCION – Born on the 26th of September, 1816, Thursday, at 8:04 p.m. and was baptized by Bro. D. Ramon Pineda. 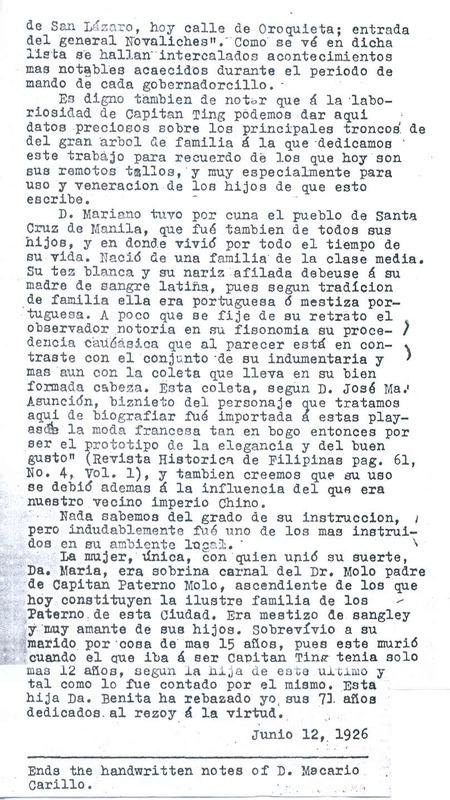 His godfather was D. Benito de los Reyes and for confirmation by his own brother, D. Epifanio Asumpcion. 12. CANUTA PAZ ASUMPCION – Born on the 19th of January, 1819, Tuesday, at 4:30 a.m. and was baptized by Bro. D. Gregorio de Jesus. her godmother was her own sister, Dona Mamerta Asumpcion. D. Mariano had as a cradle, the town of Santa Cruz, Manila, which was also the same for all his children, where he lived for the rest of his life. He was born from a modest family. His complexion was white and his nose was pointed like his mother of Latin blood who came from a family that was traditionally Portuguese or half Portuguese. A bit more noticeable on the picture was the observer’s being notorious for remembering faces. His Caucasian origin of which he appears, is coordinately in contrast to his attire and the pigtail that he carries on his well formed head. This pigtail, according to D. Jose Ma. Asuncion great grandchild of the person we refer here as the biographer, ” was of importance in these towns where French fashion was in vogue and therefore had to be a prototype of elegance and good taste” (Revista Historica de Filipinos page 61, No. 4 Vol.1). We also believe that its use was made influenced by our neighbor, Imperial China. We know nothing of the level of instruction, undoubtably, it was most instructed in its local ambiance. His wife, Dona Maria, was the only one with whom he united his fortune. She was the niece of Dr. Molo, father of Captain Paterno Molo, ascendants of those that now constitute the distinguished family of the Paternos of this city. She was a mestiza by blood and was very fond of her children. She outlived her husband by 15 years, of which he passed away when the one who was to be Captain Ting was only 12 years old, according to the daughter of the latter, and also as told by the same. This daughter, Doña Benita has already surpassed her 71st year dedicated to the_________________of virtue. CHICAGO (jGLi) – The Matnog Environmental Advocates Organization (MEAO) is a very tiny group named after the obscure municipality of my mother in Sorsogon province in the Philippines but its advocacy is getting notice in this part of the world. MEAO’s advocacy is to be more conscientious with environmental disaster waiting to happen. It got a boost last week when an indigenous villager Maria Aguinda in Rumipamba, Ecuador won a blockbuster $9.5-billion judgment and brought to its knees U.S. giant Chevron for leaving behind an environmental damage for polluting the villager’s rain forest. The multi-billion dollar judgment should send shockwaves to upstart mining companies in the Philippines, which ventured into this labor-intensive business fraught with environmental pitfalls. One such debacle in the Philippines that escaped notice was the massive environmental hazards left behind by the United States in the early nineties when the Philippine Senate shut down the bases without first requiring the US to rid the bases of their hazardous materials. Recently, the multi-national joint $45-Million investment from Lafayette, Philippines, Inc. (LPI) of Australia and the LG Group of South Korea whose contract to mine 18 out of 180 hectares, (not 5,218 hectares that I inadvertently wrote in my previous column), that straddle within Barangays Malobago, Pagcolbon and Binosawan in Rapu-Rapu, Albay province, north of Sorsogon province, was unceremoniously scrapped four months into the six- to seven-year operation following cyanide poisoning that triggered massive fish kills in the adjoining Pacific Ocean. Now comes a little-known venture capitalist named Antonio Ocampo and/or Antonio Comersiase Jr. who appear to be backed up by a gravel-and-sand delivery truck company euphemistically named Alexandra Mining & Oil Ventures, Inc. based in Quezon City in the Philippines advertising Matnog Ore Project as one of its “on-going mining projects.” The Matnog Ore Project covers 19.840 hectares (not 19,840 hectares that I earlier mentioned in my column). May I ask these venture capitalists if they have capitalization that comes close to the $45-million put up by the LPI and LG Group and be ready to lose that kind of money when disaster strikes? Are they ready to operate without PEZA (Philippine Economic Zone Authority) so that they will be paying 54 percent national and local taxes and they get only 46 percent of their ROI (return of investment)? Do they have money held in a screw so that authorities can draw from it to be given away to victims of calamities and disasters that could be caused by mining operation in Balocawe in Matnog? Do they have money that will be sourced from fine against them “for pollution” to solve among others the “Acid Mine Drainage (AMD) problem” and for “decommissioning” expenses after the mining operation and replanting of trees that were cleared prior to the mining operation? “Rehabilitation and environmental mitigation measures” are expensive propositions. Without escrow account, do they have a surety bond or disaster insurance to cover future victims of disaster that may result in the mining operation? Do they have an ownership structure that will publicly show that the incorporators of the mining permit holder have capability to pay in case of damages by showing their previous statements of assets and liabilities? Are they ready to follow the recommendations of the Presidential Rapu Rapu Fact Finding Commission Report (PRRFFCR) and/or the DENR (Department of Environment and Natural Resources) Assessment of the Rapu Rapu Polymetallic Project (DARRPP) issued in 2006? To avoid the multi-billion dollar fine in Ecuador against Chevron, are these mining permit holders ready to establish “baseline average health condition” by conducting medical tests and “blood work” of the population around the mining area free of charge so that they can show that the population has pre-existing medical health condition prior to and after the mining operation? Can DENR Secretary Ramon J. P. Paje certify that it has now re-trained its personnel following the 2006 Rapu-Rapu debacle, which according to PRRFFCR exposed its personnel as having “dysfunctional monitoring system”? And is there now an oversight mechanism that can oversee the operation before, during and after the mining operation? If the answers to all of the above questions are “yes,” then, by all means, this mining permit holder should be allowed to mine the Matnog Ore Project. Its approval should stop Governor Raul R. Lee from “politicizing” this project to harass the members of the Sorsogon provincial board, who are opposing the mining operation in Matnog. Provincial board member Vladimir Frivaldo has complained that ever since he opposed the mining project of Matnog and the STL (small town lottery, the legalized jueteng), Governor Lee has been giving him a hard time. The governor refused to give him detailed information where the previous and existing loans of the province went before he could support another request of the governor to obtain 350-million pesos loan (US$8.1-Million). Frivaldo also questioned the poor judgment of Gov. Lee for appropriating his office with the third highest budget at more than 65-million pesos (US$1.5-M) when the most important offices like the Provincial Agriculture Office, Provincial Cooperative Office, Provincial Nutrition Council, Provincial Social Welfare and Development are only getting P22.0 million (US$.5-M), P700,000.00 (US$16,279), P500,000.00 (US$11,627) and P2.7 million (US$72,790), respectively. Support to education and social services is only P1.9 million (US$44,186). Frivaldo also urged Governor Lee to build a new three-story Sangguniang Panlalawigan building because in the existing SP building when it rains outside, it also rains inside, soaking the Vice Governor, SP Members and secretariat staff.